UNITED NATIONS, December 3 -- Who would pay extra to the New York State Department of Motor Vehicles for a vanity license plate reading "UN SEC G"? Inner City Press saw this plate Monday morning on a black Cadillac Escalade parked half a block from the UN on 42nd Street, photographed and tweeted it. Click here to view. & below. Inner City Press: I'd like to know if this is a vehicle used by the S-G or UN, or if someone got a vanity plate to impersonate the S-G.
A. The Security and Safety Service is aware of this vehicle. It has nothing to do with the Secretary-General or the United Nations. Vehicles used by the Secretary-General have diplomatic plates. Local plates are of course a matter for the host country, so you may wish to take it up with the relevant authorities. Q. Separately but perhaps relatedly, I'd heard that among the vehicles damaged in the garage during Super Storm Sandy were some EOSG vehicles. Can you say if that was the case? A. No vehicles from the Secretary-General's detail were damaged during the storm. They were moved beforehand. While this showed forethought, there are still angry diplomats complaining that they had been told to move their cars from the first basement to lower in the UN garage, just before Sandy's arrival. There was damage, some of it raised during a public session of the UN's Fifth (Budget) Committee. 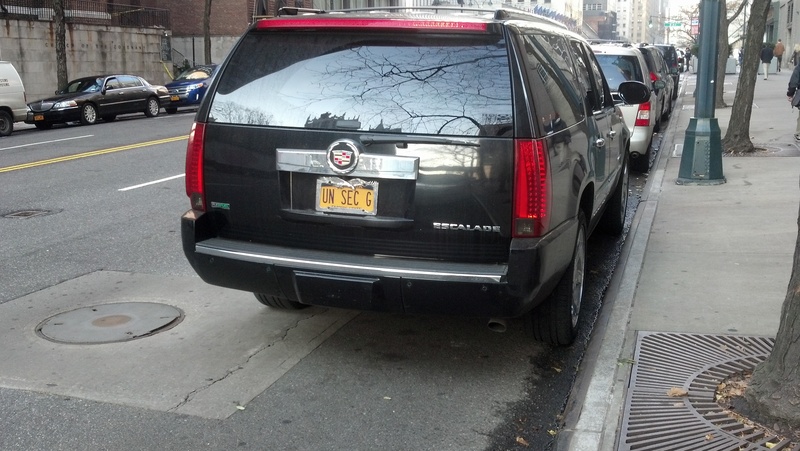 But who is it, that paid to have a UN SEC G license plate on a black Escalade? Watch this site.